A few weeks back, I wrote about hosting a New Years brunch party (remember those stunning chocolate champagne cupcakes?). 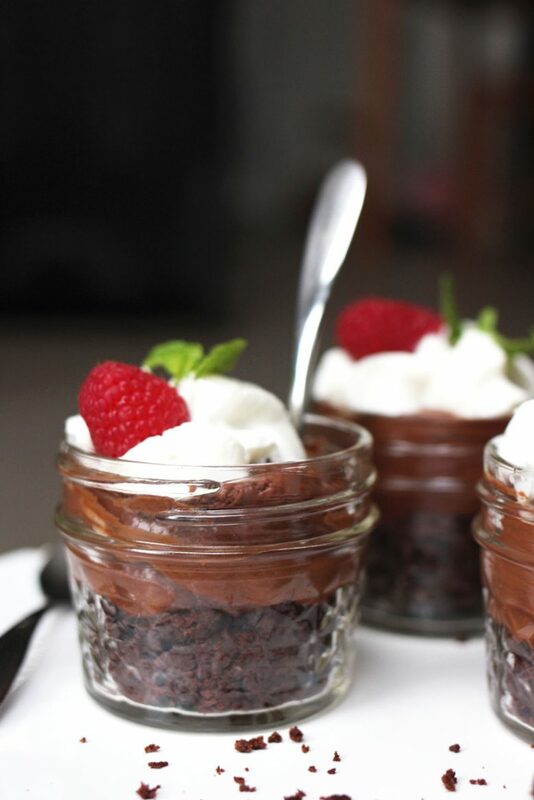 In the planning process, I procured a collection of mini 4-ounce mason jars to use as little dessert vessels. Unfortunately, my mini dessert plan turned out to be an experimental a disaster that time. But luckily, a recent chocolate craving lead me to make a delicious and easy dark chocolate mousse that found its way into the little jars. 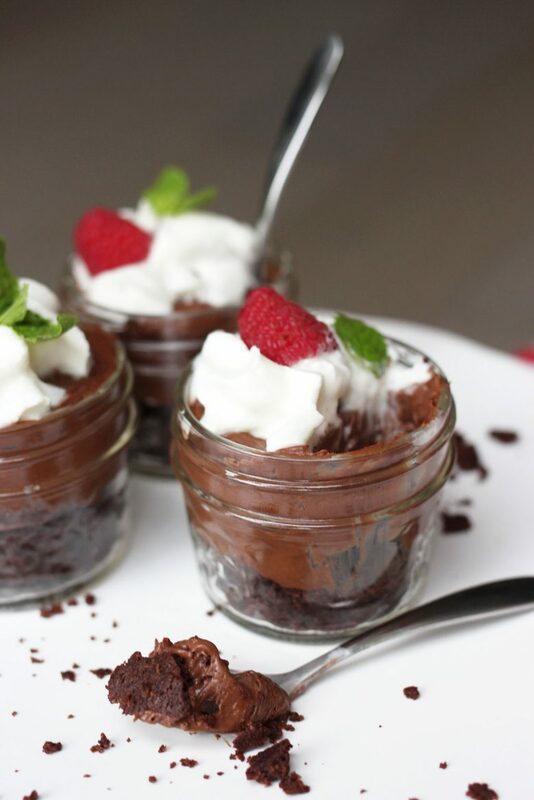 My mini chocolate dessert venture turned out to be oh-so delicious and oh-so cute! Growing up, chocolate mousse had always been one of those delicious mysteries. It was my favorite cake filling, and a popular dessert choice for me to order at a restaurant. But I never had the desire to actually learn how to make it. To be fair, I didn’t do a lot of baking growing up and in large part because my family wasn’t really into the whole dessert thing–hard to believe knowing me now, right? 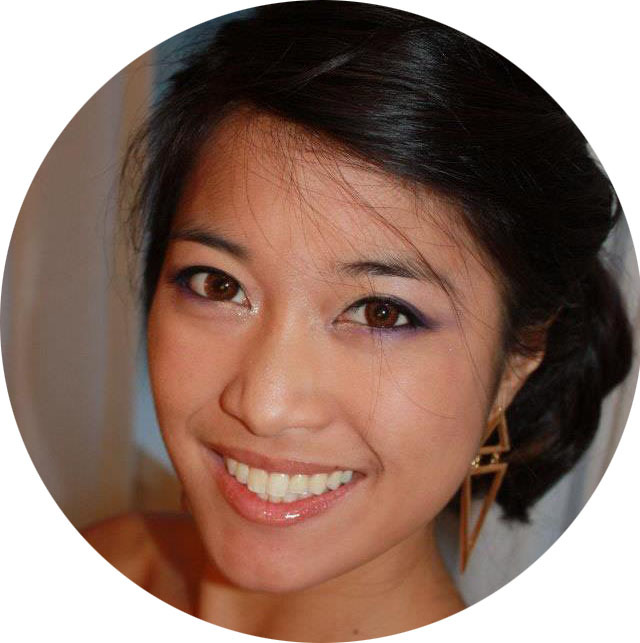 (But I guess I’ll have to credit my parents for keeping my teeth cavity-free!) So I just let it be a mystery. Now, however, I have free range of my kitchen which means I can experiment with new or augmented recipes every so often. Through a pastry course, I learned how to make French-style chocolate mousse. Holy goodness, it was amazing! But the recipe we followed was complicated, requiring softball sugar (that’s sugar that’s been heated to precisely 238F) to temperthe eggs via a pate a bombe. Unfortunately, making softball sugar isn’t exactly something that is home-kitchen friendly, nor easy! That’s where this easy(er) hybrid method comes in, where we make a stirred custard first, which is a much more straightforward way of tempering eggs! The result was still fabulous. Rich, luscious, and positively chocolatey! It’s everything that you’d expect a good restaurant-quality chocolate mousse would be. 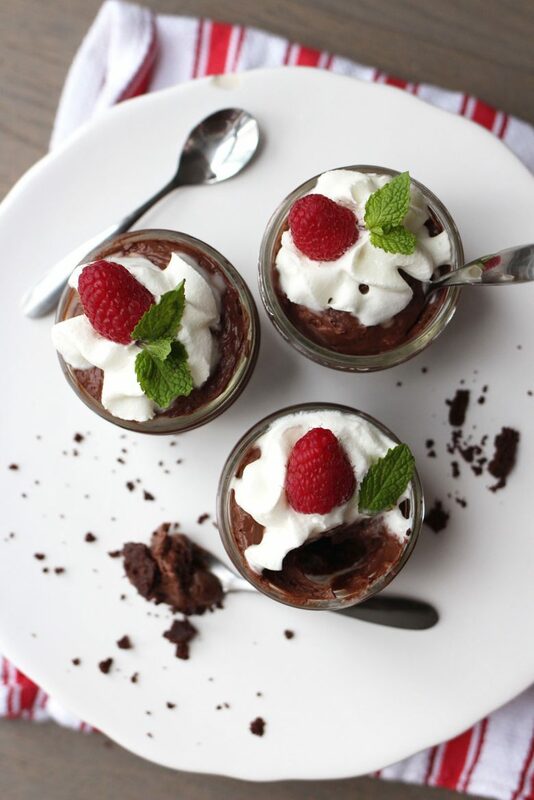 After a quick chill, I assembled mini chocolate mousse dessert cups with a brownie base followed by a generous serving of piped mousse, then finally topped with some whipped cream, a sprig of mint, and fresh raspberries. Divine. And my mason jars were happy too! :) #droolworthy. Do you have any childhood dessert mysteries that you’ve made home kitchen friendly? I’d love to hear them, or any more of your thoughts so drop me a line in the comments below! As always, thanks for stopping by and I hope you visit again soon! Chocolate cake or brownies, as needed. To melt chocolate: place chopped chocolate in a metal, heat-conducting bowl and set above a pot of boiling water. This is called a bain-marie, or double boiler. Stir with rubber spatula occasionally. The steam from the boiling water will melt the chocolate. In a mixer with whisk attachment, whisk together eggs, sugar, and salt until light and fluffy and double the volume; about 3-5 minutes. In a saucepan, heat 3/4 c of heavy cream until just boiling. Temper the egg mixture: whisk egg mixture while slowly pouring in about half of the hot cream. Then return the mixture to the saucepan and continually whisk on medium heat for a few more minutes until thickened. Be sure to constantly whisk to avoid clumping and "scrambled eggs"! Return egg mixture to mixing bowl and fold in melted chocolate. In a mixer with a paddle attachment, beat chocolate mixture on medium speed to cool and mixture is smooth and fluffy, about 10 minutes. Meanwhile, whip remaining 3/4c of heavy cream to medium to stiff peaks in a cold bowl. With a rubber spatula, fold whipped cream into paddled chocolate mixture by hand, in two additions. Fill a pastry bag with chocolate mousse fitted with a large tip or cut with a large opening. 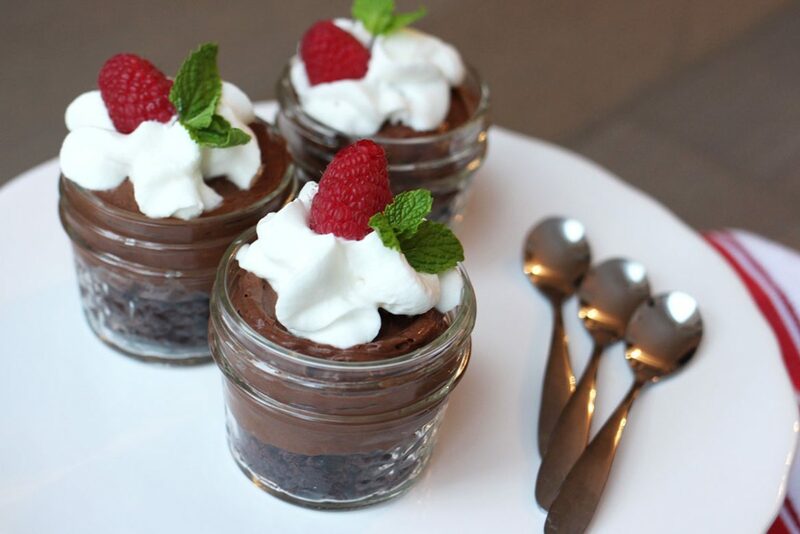 (Optionally) Add a base layer of chocolate cake or brownie to the bottom of each serving dish, ramekin, or mason jar. Pipe a generous amount of chocolate mousse in the serving dish. (Optionally) Finish with a dollop of whipped cream, fresh raspberries, mint, and dusting of cocoa powder.